The weather monsters were clearly out to get us – river levels were swollen from recent rain and we were treated to high winds (sadly not on the tail, but mostly straight on the nose), snow, sleet, hail, rain and thankfully the odd bit of sunshine from time to time. Despite the cold and the wet I really enjoyed the adventure – a little bit of twisting the truth at the registration to convince them that kayaking was my middle name and I had been K1’ing for years (Monday was my tenth time in a marathon K1 and I had never paddled in the dark or on the river before….) – and we were off. 34 miles, 36 miles, 38 miles and then a breezy 17 into Westminster on a very early Easter Monday morning, with 77 portages along the way and almost as many bags of jelly babies. Day 2: Snow to start the day off. Swim # 2 to celebrate mile 50 with only 75 to go. Seeing a stoat/weasel/mink type creature swim across the canal – much to the bemusement of a passing swan. My first bit of Thames paddling. Racing through the Oracle centre stretch in Reading city centre and concluding there were no get out points should I fall in but hundreds of shoppers would point and laugh! Walking 1.5 miles with my boat at Henley to avoid foot-high white caps and seeing my old rowing coach with the Oxford University Women’s crew and wondering just when I might get hypothermia. Seeing the finish line of day 2 (mile 70) – more than half way to Town. Being taken out to dinner by Alex’s folks and, another stint in my nice warm bed. Day 3: More snow to start the day off -very peaceful and surreal. Paddling with the flow – such a lovely change to the sluggish canal. Some beautiful stretches of the Thames. No swimming – warm and dry all day (It’s all relative). Fewer portages. Seeing my pooch and lovely Mum, all the way from home. Paddling in town-avoiding barges, yet more swans and crazy headwinds. Sunshine for the last 3 miles to Teddington & paddling with the Kimbolton lads. Finishing with only 17 miles to Westminster. Day 4: Waking up at 2.30am – getting on the water in the pitch black at 4.20am in a frosty frosty boat. Paddling in the dark. Loving the tidal flow and my increased boat speed! Which arch did they tell us to go under at the Bridges??! ‘Oh my goodness me that’s one helluva boat over there – what if I go careering into it at great speed?? ?’ A spot of sightseeing on the way. Sunrise on a silent Thames. Reminiscing about rowing on the Tideway. Not a single jelly baby. Watching the miles race by – they really were, boat speed was over 7mph!! Some tough bits when it felt like I was paddling through concrete, with arms of jelly. A stern word with myself when I realised just how far I’d paddled : ‘Don’t cry yet Sarah, you’re not at the finish’. 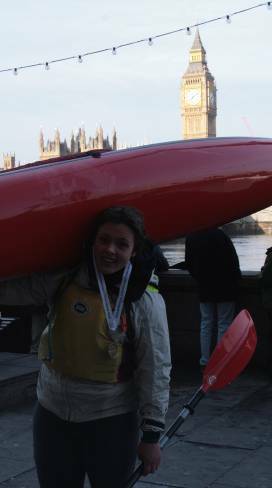 Seeing the crowds at the finish on Westminster bridge and being hauled out of my boat on the County Hall steps. Carrying my boat up the steps-I was damned if anyone else was going to do it after I’d brought it all the way from Devizes by myself. Seeing all the other crews in that I had befriended in build up races, paddled with, helped or been helped by, or been at the seminar in December with. Happy days indeed. Big happy thank you to: my wonderful Support-Crew-in-Chief, Alex and the family and folks who came along to support us and feed us each day. To the random Support Crews who fed me when Alex wasn’t there. My lovely red boat for getting me to the end in one piece. Having solo’d the DW – the gauntlet is now down to do the Endurance ‘Straight-Through’ event in a K2. Maybe the year after the ocean?! It was great to be able to share a day of your race with you but the weather could certainly have been kinder – well done – we have never seen so many jelly babies disappear! !